Try New 3 Region Blend as your latest seasonal Espresso. 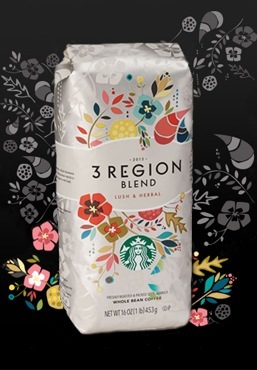 Three Region Blend combine the finest beans from each of the planet’s three coffee-growing regions: Latin America, Africa/Arabia and Asia/Pacific. Back after a successful launch last year, this sensational blend is all about the timing. We have to wait for the precise time of the year when the coffee from each of these regions reaches their peak flavor and freshness. Then, without letting one region’s flavor overpower another, we carefully blend them to create harmonious layers. Now this deep, lush and lively offering is ready to be poured directly into your cup. You’ll be mesmerized by the balance between the floral, herbal, lemon and current notes. Let the amazing array of aromas and flavors take you away. A luscious fruit salad and an international newspaper.